« GMAC wants to become a BANK! 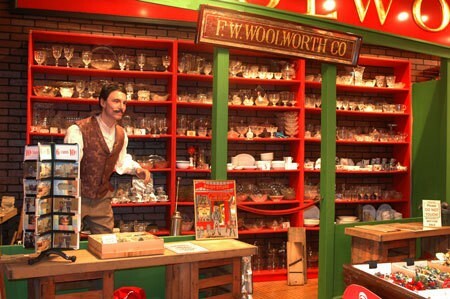 Woolworths was about to celebrate its 100th birthday this year, but instead of appointing party organizers to celebrate its century long history of success it had to appoint administrators after a vain last minute attempt to sell stores to raise cash. Â Woolworths has more than 800 stores across the UK and employs around 25,000 people according to a companyâ€™s statement. Woolworths is expected to be sold at the nominal price of Â£1, but if you own it donâ€™t think you can sell it as the stock was yesterday suspended for the second time this week. The stock has lost more than 90% of its value since the beginning of the year. It had already fallen by 62 percent in 2007. While 25,000 are agonising for their jobs, letâ€™s have a look at the facts behind Woolworthsâ€™ bankruptcy. – Credit market freeze. Banksâ€™ ability to lend has been restricted massively, but more importantly their willing to lend is close to zero. This is basically still the case, despite global government efforts to revive the economies by injecting cash, providing all sorts of guarantees, printing new money, etc. – Debt. More Debt. Too Much Debt. Of course any economically viable company should be flexible enough to cope with lower levels of demand and be able to finance its way out of an economic downturn. But not a company that is already carrying debt 16 times more than its current worth in the market. Woolworthsâ€™ current market capitalization is not even enough to pay the (debt) interest costs which amount to Â£18.6 million. The market outlook is pretty gloomy at the moment and will remain such for the rest of 2009 and possibly for the first half of 2010. Companies such as Woolworthsâ€™ that have taken on too much debt are inevitably going to find it difficult to refinance themselves. This is not a prediction, but a fact. Entry was postedon Thursday, November 27th, 2008 at 8:30 pm	under Stockmarket Watch Category.Leave a response, or trackback from your own site. Hi mate, the social bookmarking buttons are on the top right hand corner of the website! So no excuses mate 😉 just start bookmarking and sharing whatever you read and you like!